Las Vegas has an endless selection of restaurants. With so many options and difference of opinions it can be overwhelming when it comes to trying new restaurants. We've tried numerous places that come highly recommended but our personal experiences left us feeling "meh" we call these bad beats. We have a poor track record with local places that folks just love. We're often left underwhelmed. Today, I'm singling out Italian restaurants. We've been to Nora's, Bootleggers, and Ferraro's. When friends sung the praises of Casa di Amore we were skeptical. Over a year ago, I bought a restaurant.com certificate as an excuse to try Casa di Amore, but it wasn't until our friend urged us to try it last week that we finally bit the bullet. I was expecting a bad beat, but no, Casa di Amore delivered the goods. We had no reservation, but our table of three was quickly seated for an early dinner. This is an old school joint with large red booths where vintage Vegas posters and photos of Sinatra dress the walls. Warm bread got us started, an order of calamari ($13) followed. I love calamari when it's done right. When it's bad, it's BAD. There's nothing worse than deep fried rubber bands. No need to worry here, this calamari was tender and lightly breaded. The marinara sauce on the side was fantastic - well seasoned, not too acidic. I rarely find this to be the case. Needless to say, we devoured it so quickly I never snapped a photo. 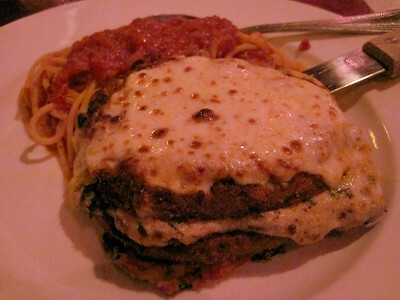 Moving on to entrees, we ordered two orders of Eggplant di Amore ($24). 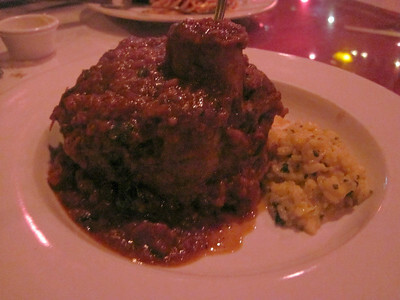 And the house specialty, Osso Buco ($35). I couldn't tell you which is better. They are wildly different, but equally delicious. Eggplant di Amore has slices of eggplant layered like lasagna with ricotta cheese, mushrooms, spinach and sundried tomatoes. It is served with a side of spaghetti. Osso Buco is classic Italian. They roast the veal shank to perfection, it falls off the bone. It's served with what I believe is an aged sharp cheddar risotto. It is unexpected and mighty scrumptious. I was much too full for dessert, but a canoli and tiramisu were ordered. 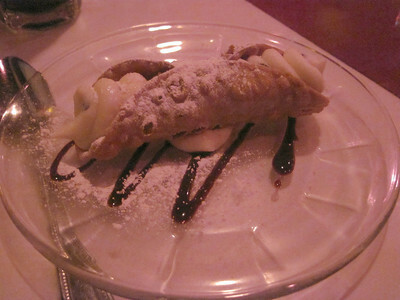 The canoli is filled to order so the shell remains crisp and the filling is rich and not overly sweet. It was a surprise to learn a free T-shirt comes with any canoli order. Service was steady and pleasant throughout. Not a single complaint could be made. Casa di Amore is a winner.